VINTAGE COSTUME ANTIQUE ESTATE JEWELRY BROOCHES AND PINS! Colorful Multi-Color Crystal Rhinestone Tennis Vintage Antique Estate Brooch Pin For Weddings, Proms, Pageants And Parties! Item #P168111 - Colorful Multi-Color Crystal Rhinestone Tennis Vintage Antique Estate Brooch Pin. Size: Length 2 5/8" x Width 1". Tennis anyone? Isn't this colorful multi-color tennis brooch absolutely delightful?! 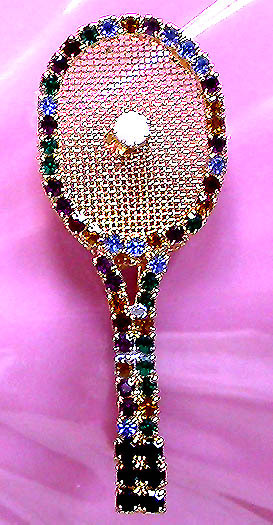 I love the cute little round tennis ball (round white bead) in the center of the golden net and the colorful multi-color faceted glitzy round rhinestones framing the entire racquet. The base of the handle is done in slightly larger jet black faceted round rhinestones. A lot of tender loving care has put into making this fantastic brooch. A perfect gift for any tennis enthusiasts. Excellent condition. Price US$38.00. SOLD.